This week we have a special podcast as we have in-depth discussion with whitetail deer hunters from Western Michigan. During a recent consulting trip to Michigan we took some time to present at a local QDMA Co-op. We felt it would be a perfect time to interview the founders as well as members of Crockery Creek Cooperative LIVE on the podcast. This Co-op has shown that this model of wildlife management among neighbors can be successful in just a few years. Listen as the founders discuss and share the hard-learned lessons of starting a co-op. Members then join us for an open discussion regarding habitat, hunting strategy, co-op benefits, community outreach, and overall hunting heritage. Previous PostPodcast #63: Is Your Habitat Adequate Enough? 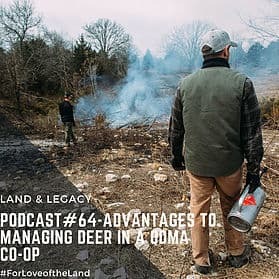 Next PostPodcast #65: Deer, Rabbit, Bobcat, Habitat. How Do They Correlate?